Three contenders in the Travel + Leisure magazine Beverage Arts Challenge will have a showdown Friday at the Halekulani resort. The finalists, chosen from among more than 250 bartenders nationwide this summer, have crafted cocktails using Grand Marnier. They'll show off their mixology skills and recipes in a grand finale, 6 to 9 p.m. at the Hau Terrace. Admission is $65; must be age 21 or over. Includes two cocktails and hors d'oeuvres. The winner will be announced that night. Then on Saturday, master mixologist Dale DeGroff hosts a cocktail party from 8 to 10 p.m. at Lewers Lounge that will once again feature the three cocktail finalists. Admission is free; 21 and over. What's fall without pumpkins? Hoku's in the Kahala Hotel & Resort is offering a Pumpkin & Pinot menu tomorrow through next Sunday. Chef Wayne Hirabayashi's Pumpkin & Pinot four-course set menu includes Pumpkin Chowder with Rock Lobster, Tasmanian Salmon Sous-Vide with a pumpkin and pinot blanc terrine, Miso & Pumpkin-Braised Black Angus Short Ribs, and dessert of Praline-Pumpkin Terrine. The resort's Plumeria Beach House has its own pumpkin menu through Saturday. Auntie Pasto's pays tribute to the 'shroom at its annual Mushroom Fest through Nov. 21. Menu specialties include a variety of mushrooms in soup, salad and sautéed with onions. Entrees include Four Mushroom Lasagna, Prosciutto and Mushroom Chicken, and Veal Scaloppini with Mushrooms. Auntie Pasto's locations are at 1099 S. Beretania St. (523-8855) and in the Kunia Shopping Center (680-0005). 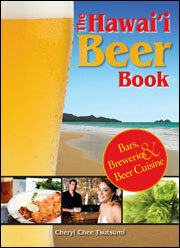 Friday's "Hops & Grinds" beer-tasting at the Willows will also serve as the launch party for "The Hawaii Beer Book: Bars, Breweries & Beer Cuisine," written by Star-Bulletin travel columnist Cheryl Tsutsumi. A limited number of copies will be sold, with Tsutsumi available to sign them. The book will be available in bookstores beginning Dec. 14. The event runs from 5:30 to 8:30 p.m. at the restaurant, 901 Hausten St. This month's "Hops & Grinds" theme is "Winter Brews" and includes beers for the holidays from Anchor Brewing, Boston Beer Co., Buffalo Bill's Brewery, Deschutes Brewery, Rogue Ales, Samuel Smith's Brewery and Sierra Nevada Brewing Co. -- as well as a pupu buffet. Tickets are $25 in advance, available at the Willows, Liquor Collection, Wine Stop and Tamura's Kaimuki; or $30 at the door. Call 952-9200.